This article is about the melon block. For the edible item, see Melon Slice. For other types of melon, see Melon (disambiguation). Few cubes get our mouths watering and stomachs rumbling quite like the melon block. It's a tasty treat that drops slices which keep your food bar looking healthy and a block that can be used to build a deliciously nutritious looking house. But hang on a second... a block that's also a melon? Has the world gone mad? Melons are blocks that grow from fully grown melon seeds. Melons can be harvested using any tool or by hand. Axes, followed by swords, are the fastest tools for harvesting melons. A melon will drop 3–7 melon slices, when broken; by hand, using a tool, or after being broken by the movement of a piston. In Bedrock Edition, breaking a melon block with shears does not drop 9 melons, rather they yield the same as any other tool. Melons are naturally generated in jungle biomes and inside "Stem farm" rooms of woodland mansions. Melon seeds can be planted, placing a small stem that will grow over time. Once the stem reaches maturity, it will attempt to generate a melon block in one of the four immediately adjacent blocks; however, this attempt may fail if the chosen adjacent block is not empty or the block beneath is not dirt, grass, or farmland. Once a stem has produced to a melon, that stem will not produce any further melons until the existing melon is harvested. Melon stems only connect to to the melons they produce. For example, if stem A generates a melon adjacent to stem B, stem B will not connect and still be able to produce another melon. Similarly, if a melon is placed adjacent to stem B, stem B would still be able to produce another melon. The same principle applies for pumpkins. Endermen can pick up melon blocks and will drop them upon death without breaking them into melon slices. Note: This video is outdated, as bone meal no longer instantly grows melon stems since Java Edition 1.5, it may take a few uses. Melons were first revealed in an IGN interview with Notch. On the Getsatisfaction.com complete ideas for the Ideas section, it was stated that watermelons were to be implemented. Melons had a bug that made them only yield 1 melon. Melons will now generate in jungle biomes. Melons can now be sold to farmer villagers, at 7–12 melons for 1 emerald. Melons will now break faster when mined with an axe. Melons will now generate in woodland mansions. Prior to The Flattening, this block's numeral ID was 103. Melon's ID is changed from melon_block to melon. Changed the texture of melons. Placing a melon into the new composter has a 50% chance of raising the compost level by 1. Melons now have a 65% chance of increasing the compost level in a composter by 1. Melons will now generate naturally in jungle biomes. Melons will now generate a lot less in jungle biomes. Melon can now be obtained using a tool with silk touch enchantment. Melons now generate in new savanna villages. Melons can now be used to fill up composters. Trading has changed, melons can no longer be used to trade with farmer villagers. Any stem adjacent to a melon block will appear to be connected to it, even if the melon was not grown from that stem. 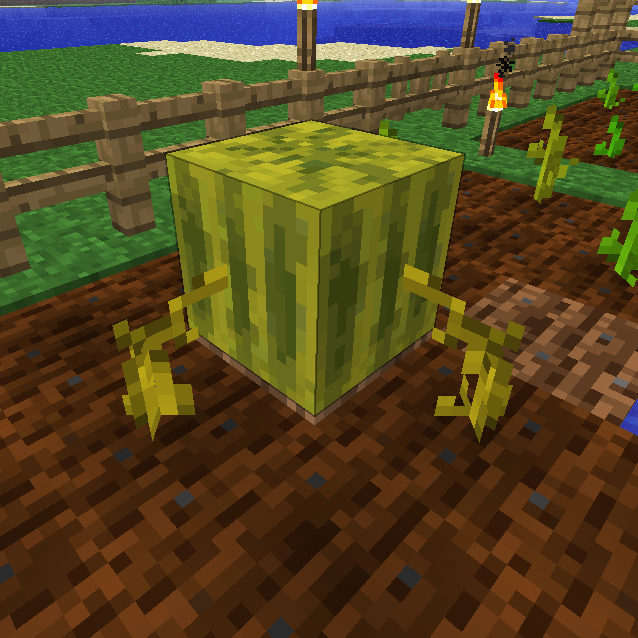 Due to this, if a melon block generates between two stems, it will connect to both of them. Pumpkins also do this, although they will not connect to plants of different species. A picture of the growth stages of a melon stem. A view of two equally efficient melon farms. A picture of 49% efficient melon farm (2nd version). A simple way to farm melons with sticky pistons. A completely automatic melon farm.